It's a situation that is posing serious problems for local ecosystems and critical industries such as tourism and fishing. 'It's the first time in history that I or anyone in the fishermen association have seen so much sargassum weed invading our shores,' Gerald Price, communications officer for the Antigua and Barbuda Fishermen Association, told IPS. He said the seaweed was clogging the engines of most of the boats used by the fishermen. While it the cause remains unclear, the Antigua Fisheries Division notes that 'strong and unusual currents from recent storms have probably brought the mass of seaweed from the Sargasso Sea to the Caribbean. 'It is anticipated that the masses of seaweeds could increase as more tropical storms are predicted for this hurricane season,' it adds. Changing currents and more powerful storms due to climate change are one possibility. Another is rising ocean temperatures, and the resulting effects on the growth rates of different marine species. Vince Best, an environmental scientist and lecturer at Antigua State College, told IPS, 'It is possible that climate change could be indirectly responsible for the proliferation of this particular weed which is currently affecting many global coastlines. The species being observed is a brown, macro-algae called Sargussum fluitans (sargassum seaweed), a free-floating algae found on the open sea surface and known to occur in this region. It is often found in association with Sargasso weed (Sargassum natans) that is native to the Caribbean. 'It's hard to tell the real reason why the sargassum weed is washing up on shores in the Caribbean without some kind of technical assessment,' Sandra Prescod Dalrymple, environmental resource management specialist with ESP Consultants (Caribbean) Inc. told IPS. Regardless of the cause, she noted that that the effects are both immediate — such as flies and other vermin, putrid scent, and inconvenience for beach users — as well as long term, and that there could be serious health issues if the situation is not dealt with in a timely and effective manner. Marine environmentalist Eli Fuller urged governments to quickly develop a comprehensive plan to deal with the problem. 'A lot of the Sargasso weed is caught up in the regular currents bringing them back to Antigua, and we have found out that the west coast of Africa has it much worse than we do here in Antigua. 'I saw a photograph of Sierra Leone that showed that they have a serious problem with the weed. It's an event, this is a historical event which is unfolding,' he added. 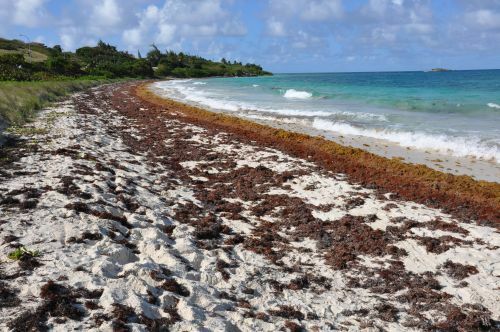 The Antigua and Barbuda government has been urging citizens to be cautious, assuring them in the process that there was no immediate health risk associated with the sargassum weed. 'The unusually large mats of algae in bays and on beaches could disrupt recreational, fishing and boating activities, disrupt the movement of marine turtles coming to beaches to lay their eggs, cause fishing gear and vessels to become entangled or obstruct general vessel traffic,' the government said in a statement. Price explained that the impact was also severe in the tourism sector after the sargassum weeds washed ashore, creating a 'nasty stink' and driving tourists away from the beaches in a country which promotes itself as having 365 beaches — one for each day of the year. The upscale St. James's Club Resort and Villas located on a 100-acre peninsula on the southeastern coast of Antigua was forced to close its doors for several weeks late in 2011 as management devised ways to cope with the sargassum weed that has overtaken many beaches on the east and southeast coasts. The hotel's vice president, Alex Debretto, said the resort has employed more than two dozen people to clear the beaches. Dalrymple warns that while it's important to remove the seaweed, countries also have to be careful since grazers rely on these plants for food and in turn provide sustenance for other creatures in the food chain. In addition, she said that these plants provide natural habitats for many living organisms and these too would suffer.